Drought is defined as a period of extreme dryness bracketed by two periods of rain. The length of a drought period can last for a week, a month, or even a year. Some droughts have lasted even longer, witness the 1920-1930s in the American Midwest. During a drought, there are just three choices: move, die, or pray. Praying did not bring on the rain in the 1930s, though many a Midwestern dirt farmer got calloused knees from trying, none the less. Actually, some life forms that cannot move (mostly plants) can go into a form of suspended animation. Desert plants are really good at this (surprise, surprise)! Throughout our brief history of living on earth, droughts have been the single most important environmental issue responsible for determining where we can live. In deserts, water is available, but it is extremely limited in quantity. That is why very few cultures have adapted to this harsh environment. Every ecosystem can be characterized by knowing just two physical parameters: the annual temperature profile and its precipitation regimen. Freshwater is crucial for all terrestrial life forms. That is why it should be valued above all else as nature’s premier natural resource. When we begin to alter our world in ways that alter the distribution of freshwater resources, we are asking for trouble. In the United States, there are over seventy five thousand dams that have created lakes, most of which are used as sources of drinking water and irrigation. In most years, this scheme has allowed farmers the luxury of growing crops that, if no irrigation was possible, they would surely fail. Other farming communities (particularly in the flat, grassy plains states) must rely on underground sources of water for irrigation and drinking water. Regarding surface water, the amount of precipitation that fell in that year will determine the outcome of agriculture in that region. For those agricultural situations that rely only on ground water, annual rainfall does little to help provide enough for extended periods of time. In our Midwest, the Ogallala Reservoir is the primary resource for irrigation water, and its been drawn down to levels that require oil-driven pumps to get enough to allow their crops of wheat and corn to thrive. This year, the price of oil was so high that farmers elected not to irrigate. The result was disastrous. In early August of this year, as I drove back home from my annual fishing trip out West, I had the “luxury” of surveying the season’s crops from Utah to New Jersey, and all the states in between via US routes 70 and 80. The USGS estimates that 2012 will go down in the record books as a very dry year, perhaps even the driest on record. Last year, Texas was devastated by drought, loosing over 5 billion dollars in crops and livestock. This year, it looks like Texas will take another big hit in crops lost to drought. In the case of the American heartland (Colorado, Kansas, Nebraska, Missouri, Illinois, Ohio), I witnessed field after field of what looked like golden wheat that upon closer inspection, turned out to be abandoned cornfields! The soybeans did not look so great, either. No corn or soybeans means no animal feed. President Obama recently declared that the federal government will buy livestock from drought-affected ranchers and set up an inventory of frozen meats to help them get by until the droughts break. What this will mean for the price of food remains to be calculated, but its certain that the consumers in most urban centers will pay a lot more for the basics of what constitutes the American diet; beef, chicken, fish, milk, flour, bread, vegetables and many fruits. A recent estimate of the amount of money this year’s drought has already cost the U.S. farmers is between 18-20 billion dollars. Some 40-50 per cent of the entire country has now been declared a disaster zone, so extensive is this year’s drought. At least indoor farmer’s crops are safe this year, having opted long ago to grow their crops in a more secure, predictable fashion in greenhouses. 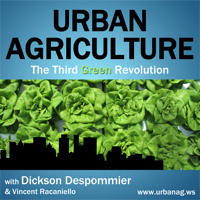 Vertical farming promises to expand this approach, so that perhaps in the near future, food prices will not fluctuate with the uncontrollable weather patterns. Dare I remind us all that climate change issues will continue confound and disrupt this already seriously flawed system of outdoor food production. What a different world this would be if we could produce most of what we needed year round in vertical farms located inside cities. 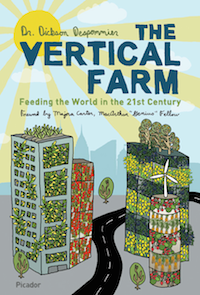 I know this sounds a bit preachy, but I think the concept of the vertical farm is the only viable option we have to a long-term solution to the world food crisis. Why, I’ll bet we could even work out a way to produce animal feed this way, too. Who knows, maybe some day soon a Texas billionaire will step up to the plate and start that ball rolling!